CES 2015 has been filled with new and innovative technology such as the NVIDIA X1 superchip, LG G Flex 2, and even Android Auto. 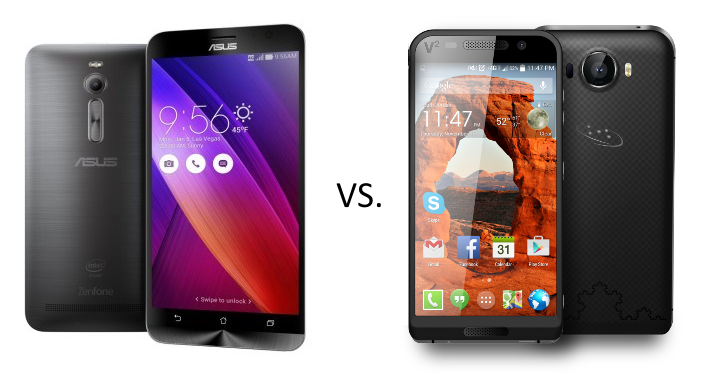 Two devices that created a stir were the impressive debuts of the Asus Zenfone 2 and the Saygus V2. Both of these devices lead the charge with innovation in 2015, but both for different reasons. The Saygus V2 comes with a massive amount of storage (up to 320 GB) and the Asus Zenfone comes with an Intel Atom processor backed by a whopping 4 GB of RAM, the first smartphones of their kind respectively. The Saygus V2 is in its own category for a few reasons. Not only does it come with support for dual microSD cards backed by 64 GB of internal storage, but the device comes rooted and unlocked out of the box. This is something that no other phone manufacturer has done as of yet, and it is a great push for mobile freedom. Current manufacturers don’t particularly care for rooting, but they don’t support it either. So the fact that Saygus is stepping up and doing it, it’s good for the mobile community. For a more in-depth analysis of the Saygus V2, go here. The Asus Zenfone 2 comes in as the first smartphone to feature 4 GB of RAM. Previously, all Android phones had 32-bit architecture because the Android operating system didn’t support 64-bit architecture. Now with the support of 64-bit architecture with Android Lollipop, devices will no longer suffer from the 3 GB RAM barrier. We are just entering 2015, yet Asus has already entered the realm of 4 GB of RAM. They are setting the standard for other manufacturers to follow, especially with their low price-point. For a more in-depth analysis of the Asus Zenfone 2, go here. Even though Asus and Saygus are leading the charge to 4 GB of RAM and super user permissions out of the box, I don’t see phone OEMs adopting this right away. There will still be devices with 2 and 3 GB of RAM for some time, mainly because Android continues to be improved for less and less memory. I only expect to see 4 GB of RAM and premier flagships, such as the Sony Xperia Z4, LG G4, and Samsung Galaxy Note 5. As far as being rooted out of the box, the only manufacturers that will likely see this treatment are smaller companies such as maybe OPPO and OnePlus. It would be hard for me to believe that Samsung or Sony would adopt this. Regardless, it is good to see less popular smartphone manufacturers taking the next big step before their bigger counterparts. It is a good way to force the bigger OEMs to follow the path of innovation. Both devices have very good specs and are sure to sell well with their prices. The Zenfone 2 is expected to start at $200 whereas the Saygus V2 is rumored to be in the range of $400-700. Below you can see the specs of the Asus Zenfone 2 and the Saygus V2.